The Army National Guard serves an important role in disaster relief. When called upon, members of the service leave their families at a moment's notice, pack up and head into the thick of the worst that mother nature has to offer. In the case of the recent flooding in New York, New Jersey and Vermont, that means going above, beyond, and sometimes below the call of duty, er, waterline. From the looks of things, the soldiers in the video after the jump are in the process of rescuing residents - or at least attempting to rescue residents - in Manville, NJ who failed to heed flood evacuation warnings. 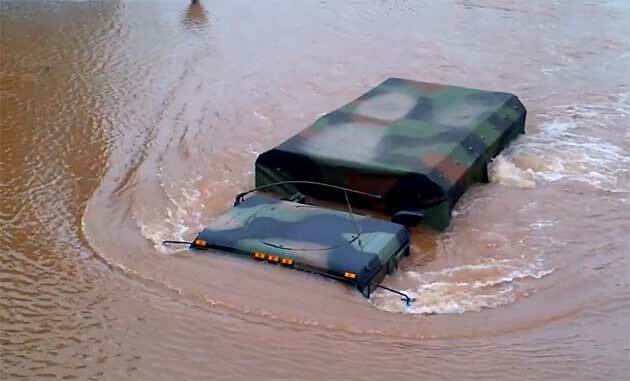 Though we aren't huge military vehicle buffs, we'd say it looks like two Deuces braving severely flooded New Jersey streets. Big points to the videographer who simply stands by and insults the service members out to help him instead of actually warning the soldiers that the waters get deeper farther down the road. Class act. Proof the National Guard will do anything to save you in a flood originally appeared on Autoblog on Tue, 30 Aug 2011 19:58:00 EST. Please see our terms for use of feeds.